Wishing you and your family a very Happy Navarathri. ﻿Navarathri is going to begin from tomorrow after this Mahalaya Amavasya day. Navarathri means a 9 day festival of Goddess Lakshmi, Goddess Saraswathi and Goddess Durga. This is celebrated by Hindu religion in different states of India. You can see Golu i.e decorating the house with dolls. They keep 3,5 or 11 padi/steps. Each day various prasadam is prepared and exchanged with ladies. Gifts are also bought and given with Kumkum. Many people keep fast on these days. Sundal is a usual prasadam prepared with the dals and its very healthy. These 10days food is prepared without onion and garlic. Mysore, Karnataka, India is famous for Mysore Dasara and 10days its celebrated very grand. Navarathri starts from 8th Oct and ends on 17th October. 16th October is Saraswathi Pooja, on this day books and music instruments are kept for pooja. 17th October is Vijayadashami. Aksharabyasam is also done for children before going to school on this day. Children enroll into music, dance and other classes on these days. During these 10days of the festival cleaning or dusting are to be avoided until the Ayudha Pooja day. In many places classical music navaratri concerts are conducted. Lots of sweets are distributed in factories and many enjoy the holidays with family and friends. In North India, they have garba and dhandiya cultural dance for this festival. On Mahalaya Amavasya payasam or sweet is prepared and offered to God. Since am abroad we dont keep Golu but still do all the pooja and prasadams. Here is the prayer when lighting the lamp sent by my cousin. Who is Goddess Durga and the meaning of Durga? Durga, in Sanskrit means "She who is incomprehensible or difficult to reach." 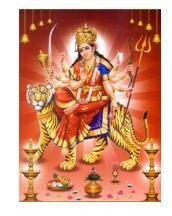 Goddess Durga is a form of Shakti worshiped for her gracious as well as terrifying aspect. Mother of the Universe, she represents the infinite power of the universe. The manifestation of Goddess Durga is said to emerge from Her formless essence. There are endless aspects of Durga described in the Puranas and Agamas and the iconography is consequently very varied. She is usually pictured as having ten arms holding Sword, Conch, Discus, Rosary, Bell, Winecup, Shielf, Bow, Arrow, and Spear. She is most often shown riding a lion from which comes Simhavahini. She is gorgeously dressed in royal red cloth and has several ornaments decorating her beauty. Her hair is dressed up in a crown (karandamukuta) which then flows out in long luxuriant tresses that are darkly luminous and soothing to the eye. The various tools reflect the eminent supremacy that helps in controlling the universe. * Will upload photos of Golu soon. happy Dasara to u too.. Happy navarathiri wishes to u too..
Just joined in your blog..Happy navrathri! !